In a just over a week, the largest-ever contingent of Canadian entrepreneurs will congregate at the seat of Canada’s government, on Ottawa’s Parliament Hill, to engage in a national celebration of Canadian entrepreneurship. I’ve been proud to be associated with Startup Canada since its genesis more than 18 months ago and I love the idea of Startup Canada Day on the Hill, a milestone event that will manifest the momentum, impact and scale of the grassroots start-up movement in Canada. The day will also advance discussion on the crucial role played by partnerships between entrepreneurs, independent organizations and government in maximizing entrepreneurial success. When you look at the numbers, there is no doubt entrepreneurship benefits all Canadians. Small businesses represent a huge part of Canada’s work force, and they created more than three-quarters of all private-sector jobs from 2002 to 2012, according to Industry Canada statistics. Entrepreneurs are the foundation of prosperity in Canada, and a strong, national ecosystem supporting them should be bedrock public policy at all levels of government. That’s why I’m behind Startup Canada on the Hill — so that elected leaders and senior government officials are encouraged to make certain that Canadian entrepreneurs are equipped with the best possible means to maximize their contributions to Canadian society through their enterprises. 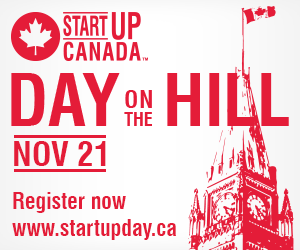 Startup Canada on the Hill will feature panel discussions and keynote speeches from industry, community and government leaders, all designed to strengthen the national culture of entrepreneurship in Canada and remove barriers to startup growth by connecting the individuals and organizations vital to the success of entrepreneurship in Canada. The event will draw more than 700 attendees, including ministers, members of parliament, entrepreneurs and business leaders. I will, unfortunately, be out of town most of next week and so unable to attend. However, I encourage you to register before Friday so you can join in this entrepreneurial invasion of Parliament Hill.